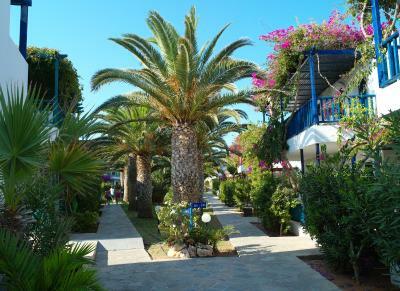 Lock in a great price for Stella Village Hotel & Bungalows – rated 8.3 by recent guests! 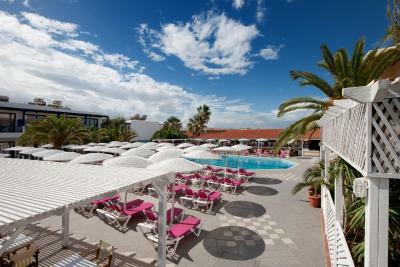 Friendly staff and great animation team, nice pool, good quality of meals, located on the beach. Had a wonderful rest. Thank you! Absolutely wonderful experience !! Fabulous few days!!!! Clean bright rooms,lovely food!!! Amazing kids pool and wonderful shows for the whole family!!!! Lovely staff and very professional...😊😊😊 For sure we come back next year!!! Fantastic service, super friendly staff all willing to go above and beyond to make your stay perfect . 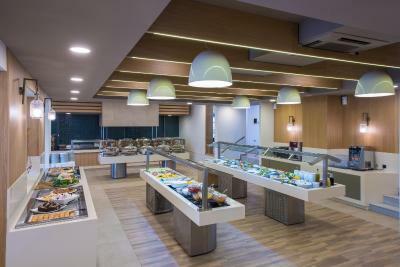 Clean, plenty of facilities and good food. Strictly speaking, it's not full 4-Star premises – no marble floors, staircases decorated with Swarovski crystal etc. 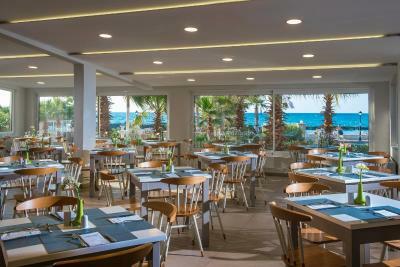 But everything else is fully compensated by absolutely friendly, well-trained and motivated staff (Faniz, Marina, Josephine to mention just few), nice location, good meals and, of course, by the sea and the beach. If you prefer a club life with all night long dancing/socializing – look somewhere else. 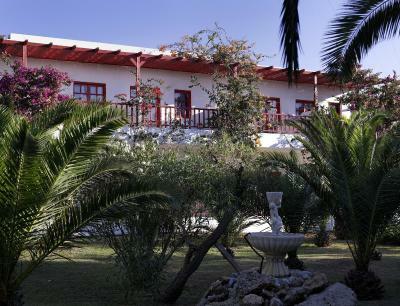 This a peaceful resort for relaxation – be it a family with few kids or grownups. You’ll find a lotta entertainment for the former and endless choice of cozy places/drinks for the latter. 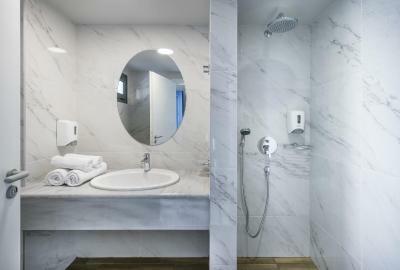 Everything you need (even some extras that you did not find in your room - like iron, bathrobe - can be arranged in second by simple phone call. Amazing staff. Especially Stella. Great choice at meal times. First time my husband and five kids have been away together. Hotel well situated. Private beach (Needs a bar!). Rooms clean simple and bright. 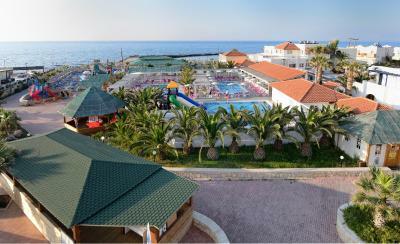 Entertainment, swimming pools, location near the beach, shows for the kids. Food was excellent. First of all, many thanks for Stella and her reception team who upgraded our lodging. We also liked the food and the all inclusive service. Appartments are spacious and have nice terasses. Everything was. Excellent!! We loved it.. All the shows every evening!!! Activities with kids in morning... All. Meals were gud instead of we being vegetarian!! Gud options!! Many swimming pools options for kids and elders!!... All cocktails and wine beer inclusive!!! 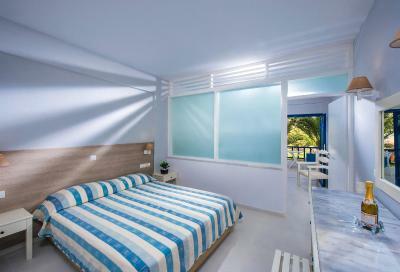 Stella Village Hotel & Bungalows This rating is a reflection of how the property compares to the industry standard when it comes to price, facilities and services available. It's based on a self-evaluation by the property. Use this rating to help choose your stay! 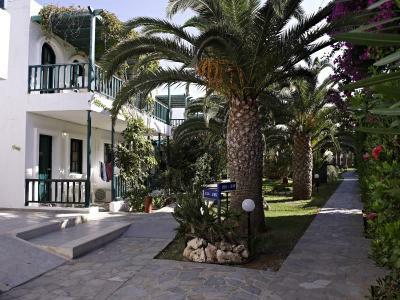 One of our top picks in Hersonissos.Just 30 feet from its private beach in Analipsi, Hersonissos, Stella Village features 2 swimming pools with poolside bars surrounded by colorful gardens. 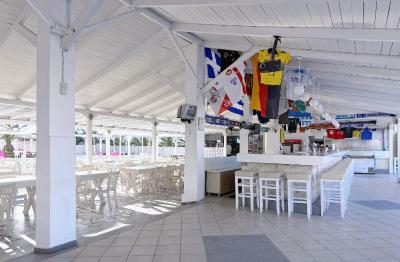 It offers 2 restaurants, 2 tennis courts and a kids club. 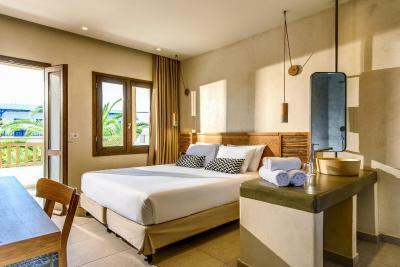 The spacious and bright rooms at Stella Village feature a furnished balcony overlooking the gardens. Each comes with a satellite TV, fridge and air conditioning. 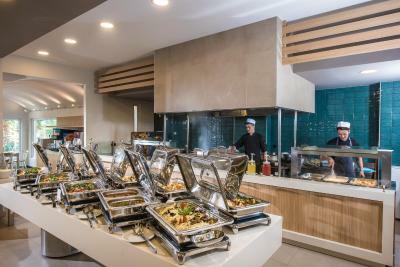 The buffet restaurant serves meat, fish and vegetarian dishes. Special theme nights are organized weekly. 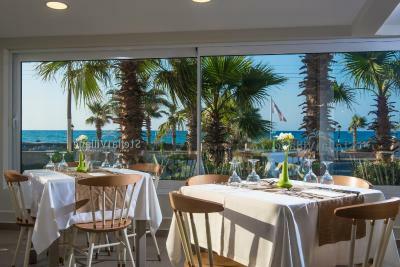 Elia Restaurant prepares Mediterranean and international cuisine. 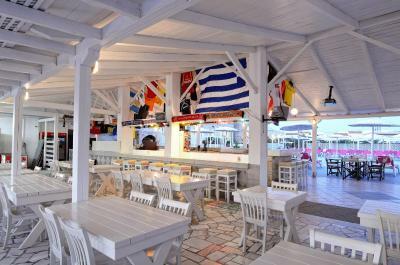 Coffee, refreshments and drinks are provided at the 2 pool bars that in the evening also play music. Wellness options include water aerobics sessions, a soccer field and beach volleyball facilities. 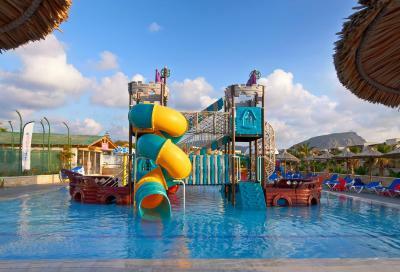 Younger guests can have fun at the 3 children’s pool, at the playground or participate in the games that the entertainment team organizes. 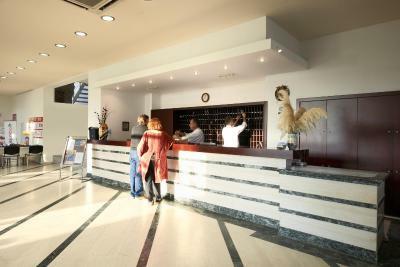 The staff at the 24-hour front desk can arrange car rental to explore Hersonissos Town 2.5 miles away. 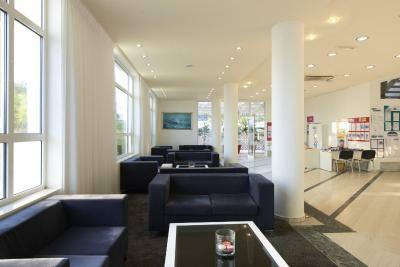 Heraklion International Airport is 12 miles from the hotel. Free private parking is available on site. 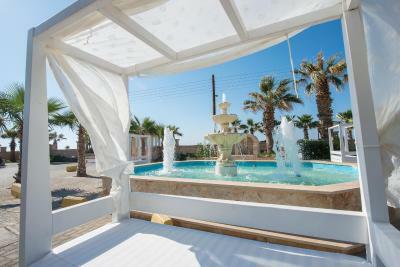 When would you like to stay at Stella Village Hotel & Bungalows? 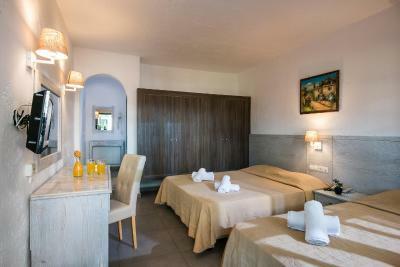 Only 11 yards from a private beach, this spacious and bright room features a furnished balcony overlooking the gardens. It comes with a satellite TV, fridge and air conditioning. Please note that this room can accommodate 2 adults and one child. 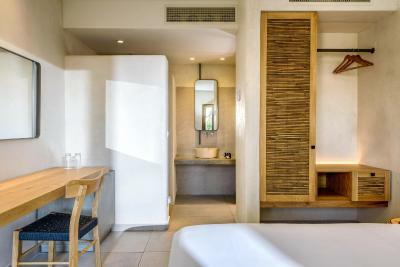 Just 11 yards from a private beach, this spacious and bright room features a furnished balcony overlooking the gardens. It comes with a satellite TV, fridge and air conditioning. 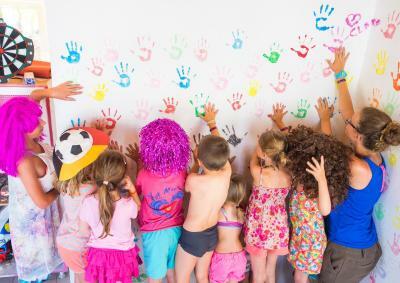 Please note that this room can accommodate 3 adults or 2 adults and one child. 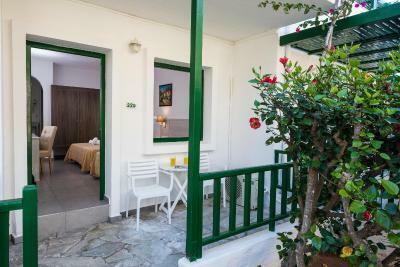 Overlooking the garden, this bright, air-conditioned room features a furnished balcony. It has a TV with satellite channels and a mini fridge. 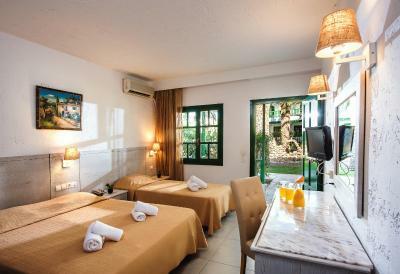 Overlooking the garden, this superior, air-conditioned room features a furnished balcony. It has a TV with satellite channels and a mini fridge. 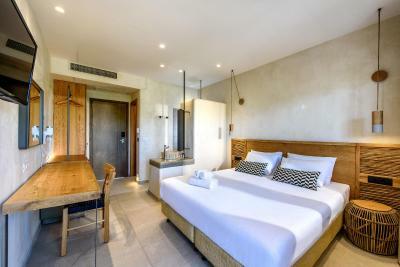 Stella Village is a family-friendly hotel that offers a range of accommodation types, from rooms to apartments and bungalows. They are bathed in natural light, airy and spacious, and features include air-conditioning, fridge and lateral sea, mountain or garden views. 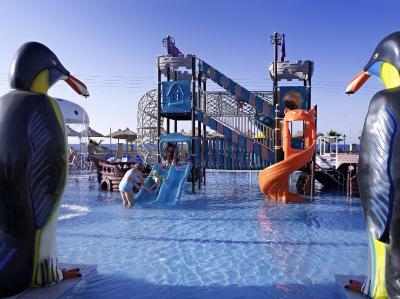 Children will love the mini-club, playground and the 2 children's pools. 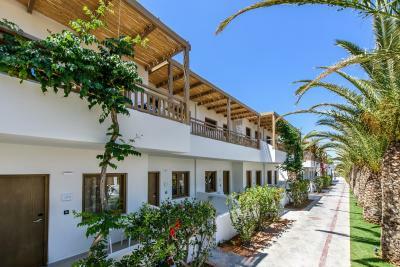 There are 2 large swimming pools for adults, internet corner and WIFI in the main building, sports facilities as well as two fantastic restaurants and two poolside bars. 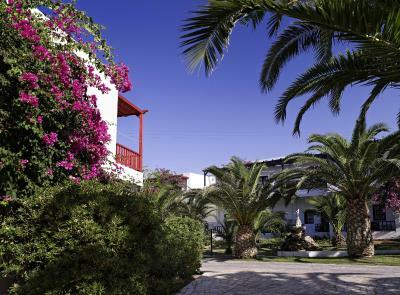 A wonderful hotel for a family holiday under the Greek sun. House Rules Stella Village Hotel & Bungalows takes special requests – add in the next step! 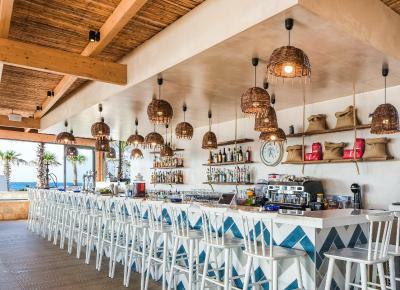 Stella Village Hotel &amp; Bungalows accepts these cards and reserves the right to temporarily hold an amount prior to arrival. 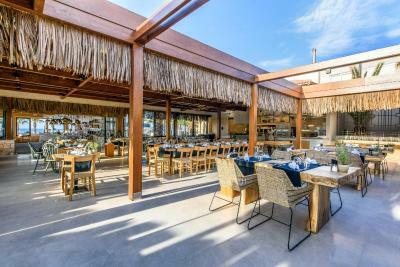 Stella Village Hotel & Bungalows accepts these cards and reserves the right to temporarily hold an amount prior to arrival. 1 pet per room allowed upon request. Great Hotel - Professional Staff !!!! This is a landing zone for Heraklion International airport – means every 5 to 15 minutes you have a jet passing right over your head. You may love it if you are with Flightradar 24 or just a volunteer tracking each and single flight, but I’m not. Second source of unwanted noise might be badly behaved kids (and there were some of them, sorry). Mattresses too soft, pillows too hard. No duvets. Only blankets. I am very happy we could have stayed at this great place. 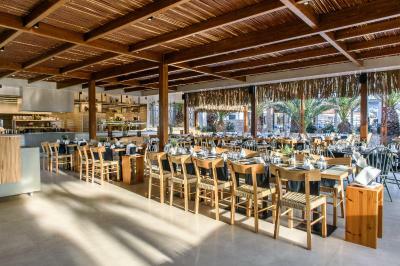 Everything was perfect, delicious food, very good wine, the staff was amazing, very friendly a helpful. We spent there 7 wonderful days with our 3 years old daughter. The sandy beach was great, very good access to the water, also the pier was helpful, as there were not big waves. The loungers were free of charge and you always found your own during the day. Food was great, especially the cakes :-) Our room n. 408 had a garden view, it was very nice. We could have heard the music in the evening, but it wasn't disturbing. This part of Stella Village was intended for families, so far away from the "evening noise", but still close to the swimming pools, restaurant and beach. 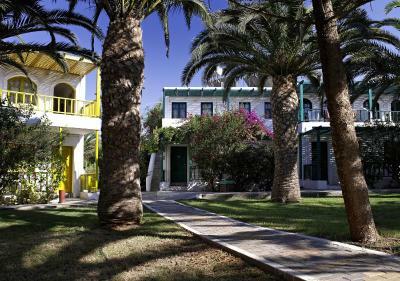 We visited Analipsi town and also went to Hersonissos with the cruise train. Everyday there is a bus to Heraklion market at 9.30 in front of the hotel, coming back in the afternoon. You could reach with him also Gouves. Shops are next to the hotel, you can find there almost everything. I can fully recommend this hotel to everybody, as it is not only for families with kids. Thank you very much for this wonderful stay at your premises. Cleaning was bad. Wi-fi is terrible and it simply does not work in the room. Room could be renovated (old fashioned). Bath tube is terrible. Every time you take a shower the entire bathroom gets wet. The holder of the shower was broken and I had to hold it the whole time. The people at the front desk were not very helpful. We asked for some tips about what to do in Heraklion but they provided almost no information. Did not have even a map of the city. They were also a bit confused, did not know how the hotel works. Someone told me to take the towels for the swimming pool at the Stella Palace hotel, so I had to walk for 10 minutes just to get a towel. Later on I found out I could have taken it at the reception of the Stella Village hotel!! Airplane noise during the night. The hotel beach is not something, but 500m away there is a nice one. The pieces of color from the playground in the swimming pool was the main thing I didn`t like. The second thing - pillows absolutely not suitable for sleeping, as they are too high. It is possible to smoke everywhere, and it is not too pleasant, if you are used to smoking is under control in your country. The room was closed every day and the ladies were very helpful and polite, but the cleaning itself was far from perfect. Though it didn´t spoil our holiday. Be careful when swimming not to step on the sea hedgehogs, there is plenty on the stones. The hotel is nice. The territory of the hotel is big and nice. 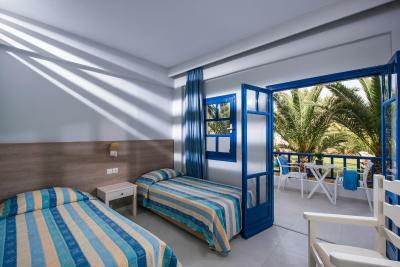 It is possible to get a room away from the pool, so that there is not that much noise (if you have normal neighbors). If you want extra silence, then you have to book a bigger room (includes 2 rooms) in the old part of the hotel. There is no parties there, the pool is open from 9-20 and the bar till 18. At least it was so in May 2018. 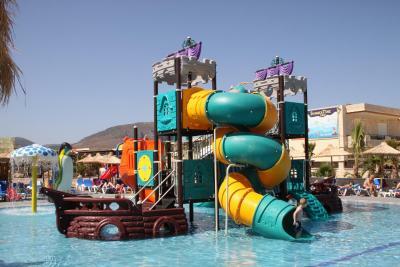 The hotel is full of families with small children, so you should take this into consideration when making your choice. Rather not a hotel for parties all nights long, as you will have small neighbors sleeping at night. The sea is close and not that much traffic on the street. The water and sand are clean. Nice beach especially for small children. There is a shop in the hotel and several shops very close, so that you can buy almost everything you need. The personnel is great, very helpful. Nikolas (sorry, do not know the right way to spell the name) is a great guy, who will make your mood every time you go to eat. The food was tasty. I never understand people saying, that they get tired of the choice or 6-7 choices is not enough. Do you really have that much at home every day? Or do you go on a holiday to eat? 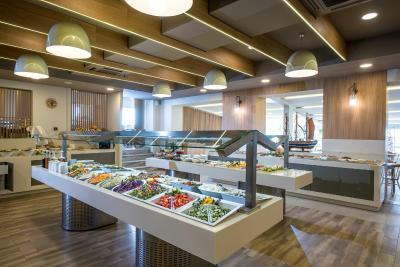 The food was fresh, tasty and the choice was big enough for us. Really no porrages or real soups for the child, but still found something for her. We bought the fruits from shops and markets, if happened to have some on the way. Also there is a car with fruits close to the hotel (I am not sure, if every day). For us was rather strange, that nice coffee could be bought from the bar only starting from 10am. But not a big problem. The bus stops close to the hotel once a day, around 9:30 (around - because it may happen, that the bus is 10-20 minutes late, not on this stop only). We used the stop on the main road in Analipsis (around 20 min walk from the hotel).